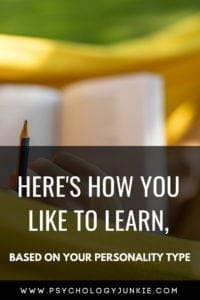 Every individual can love or hate learning depending on how they are taught and whether it goes in stride with or against their personality type! With back-to-school right around the corner, these tips can make or break your day! ISTJs and ISFJs like to have a specific, clear plan of action when they learn something. They want to know where to begin, how to find “Point A”, and then “Point B”. They like to accumulate facts and details and organize them carefully so they know where to find them, how to use them, and how they are categorized when they work on a project. They pace themselves, working steadily until they reach the end, rarely taking breaks until they are finished. As sensing types, ISTJs and ISFJs like to know the real-world impacts of what they’re learning. Abstract theories can be interesting, but they are more fascinated with things they can use in a tangible way in their lifetime. They tend to be stimulated by hands-on projects, career demonstrations, and volunteer opportunities. How to Inspire: Show them the real-world, practical application. Interaction: Let them reflect on material before asking questions. Give them details, facts, and evidence. If they seem confused, ask them if they need more specifics or if they’re unsure where to begin. Different needs for ISTJs and ISFJs: ISTJs care more about competence, credentials, and independence, whereas ISFJs care more about support, affirmation, and encouragement. ESTPs and ESFPs want to experience the world in a direct, hands-on way. These are the types least catered to in the academic world where sitting still at a desk all day listening to lectures is the norm. ESPs want to experience tangible reality – they want to touch, smell, taste, manipulate, and see everything. Experimenting in a hands-on way, learning while moving, and being active all help them to enjoy the learning process. They do well to learn while walking around, looking out a window, or using their hands as much as possible. ESTPs and ESFPs are perhaps the most practical learners. “What can I do with this now?” is the question they are most likely thinking. If the subject matter gets too hypothetical and theoretical it can feel like a waste of time to them. Atmosphere Preferred: Collaborative, Kinesthetic, Unstructured, and Active. Order of Instruction Preferred: Sequential, linear. How to Inspire: Give them opportunities for action and hands-on activity. Show them the real-world application for what they are learning. Let them get up and move around. Give them unstructured time. Interaction: Be direct and specific. Use storytelling if at all possible. Teach them in a hands-on way as much as possible. Have a sense of humor! Different Needs for ESTPs and ESFPs: ESTPs will be much more motivated by competition and challenge than ESFPs. ESTPs will also be much more comfortable playing devil’s advocate in the classroom. ESFPs need to feel affirmed and supported and will feel much more inspired if they have a supportive group of friends around them. INTJs and INFJs are quiet and imaginative learners who are focused on long-term goals and abstract concepts. They like learning that focuses on the future or the big picture, and they enjoy doing anything in a new, creative way. They especially tend to excel at creative writing. Both INFJs and INTJs tend to get bogged down by repetitive, routine-oriented work and instead prefer to discuss new, novel subjects. They tend to have a steep learning curve because they are so dissatisfied by repetition that they want to keep moving onto the next best thing. If they have to memorize information, they utilize acronyms or analogies to try to hold it together in their mind. Both INFJs and INTJs are strong independent learners and like lots of private time to process what they are learning. They tend to eschew the “back-to-basics” approach of classical, sequential learning, and prefer a more innovative, independent approach where they can find their own non-traditional ways to solve problems. Order of Instruction Preferred: Start with the big picture and goal, fill in with details as necessary. How to Inspire: Focus on long-term goals, the future, the big picture. Give them freedom to come up with their own new ways to complete projects. Offer them the opportunity to learn something new once they finish something. Stimulate their imagination. Let them strategize and extrapolate about future possibilities. Interaction: Focus on the implications of what they are learning rather than the details. Ask them questions. Be prepared for them to play devil’s advocate. Different Needs for INFJs and INTJs: INTJs are more focused on challenge and achievement, and are motivated by a concern for justice. INFJs are more comfortable when the classroom is affirming, when they receive reassurance, and where they can learn how the material will benefit people. Extraverted intuitive types like ENFPs and ENTPs learn best when they are presented with a lot of options and possibilities. They like to tackle novel subjects and brainstorm creative solutions to problems. Repetition, routine, and structure make them feel stifled. They are innovatively creative and enjoy open-ended problems and activities that allow them to work in their own way without having to stick to a pre-ordained method. They like to ask lots of questions and look for the deeper-meaning behind rules and concepts. They rarely take anything at face-value. They like activities that allow them to integrate, strategize, make inferences, and extrapolate. ENFPs and ENTPs enjoy thinking about future scenarios and possibilities, so they need to feel that what they are learning has possible impacts on the future ahead of them. They usually enjoy discussing philosophy, science, and art, and they tend to excel at creative writing as well. Atmosphere Preferred: Open-ended, collaborative, unstructured, creative. How to Inspire: Focus on possibilities, the future, the big picture. Give them freedom to come up with their own new ways to complete projects. Encourage them to finish a project by offering them something new and interesting to start once they are finished. Stimulate their imagination. Interaction: Focus on the implications of what they are learning rather than the details. Ask them questions. Be prepared for them to play devil’s advocate and ask “why” a lot. Don’t take their arguments personally; they are wired to see things from many different angles and perspectives. Different Needs for ENFPs and ENTPs: ENTPs are more focused on competence, achievement, and winning. ENFPs are more comfortable when the classroom is affirming, when they feel inspired, and where they can learn how the material will benefit people. INTPs and ISTPs are quietly analytical and extremely independent. They don’t need a lot of collaboration and socialization to be motivated to learn. They are natural learners as long as they are interested in the subject at hand. In fact, a lot of socializing and collaborative projects can make them feel irritated, because everyone else can get in the way of their learning process. They are often underrated in terms of their intelligence simply because they tend to keep to themselves more and don’t feel the compulsion to “prove themselves” to teachers like TJ students tend to. They are competitive with themselves and are more concerned with meeting their own standards than the standards of others. Grades carry much less meaning to them than to other types. That said, they are often intelligent and both types tend to get above average IQ scores (MBTI® Manual, Page 269). Both INTPs and ISTPs are motivated best when there is a competition or a challenge they can embark on. Competing is fun for them and gives them something to strive for. Without a lot of challenge they will get bored and let their minds wander to more personally interesting or engaging subjects. Atmosphere Preferred: Open-ended, quiet, unstructured, creative. Order of Instruction Preferred: For INTPs, start with the big picture and goal, fill in with details as necessary. For ISTPs, a sequential, linear path of instruction is preferred. How to Inspire: Challenge them and give them a way to compete or a “game” to play to learn the material. For INTPs, focus on concepts, the future, the big picture. For ISTPs, focus on real-world application and practical use. Interaction: For INTPs, focus on the implications of what they are learning rather than the details. Ask them questions. Be prepared for them to play devil’s advocate and ask “why” a lot. Don’t take their arguments personally; they are wired to see things from many different angles and perspectives. For ISTPs, be as direct and literal as possible. Don’t veer off into hypotheticals and rabbit trails. Get to the point! SHOW them as much as possible why it’s important in real life to learn what they need to learn. If they don’t see any real-world application they will be de-motivated. Be prepared for them to play devil’s advocate. Give them as much hands-on opportunity for learning as possible. Different Needs for ISTPs and INTPs: ISTPs are much more literal, sensory, and focused on real-world application. They are highly analytical, but they also want to DO something with what they learn. Just tossing an idea around for the sake of it will seem pointless to them. INTPs are much more interested in theory, abstract concepts, and envisioning future possibilities. They enjoy tossing ideas around, theorizing, and posing hypothetical questions. They will be more motivated by future possibilities than by current application. ESTJs and ENTJs like to learn through competition and challenge. They enjoy making goals and working hard to achieve them. Both types like having to-do lists and charts they can use to track their progress, and both are motivated by a structured, organized atmosphere. Fact-retention and memory games are motivating for ESTJs (games like classroom jeopardy), whereas strategic learning games are more fascinating to the ENTJ. As thinking types, ESTJs and ENTJs both care about competence a great deal. They will get frustrated with wishy-washy teachers or teachers who ramble too much. They have less of a need for affirmation and more of a desire to have a direct, knowledgeable, challenging teacher. Order of Instruction Preferred: Sequential and Linear for the ESTJ. Big-picture first for the ENTJ, followed by details as necessary. How to Inspire: Give them opportunities for achievement, competition, and independence. Give them real-world goals to accomplish. Challenge them. Interaction: Be direct, clear, and logical. Don’t waste their time worrying about sugar-coating anything. Don’t get bogged down in details or tangents. Stay on course. Different Needs for ESTJs and ENTJs: ESTJs like to do things by-the-book and will enjoy a more classical approach to education. Practice, repetition, and routine help them to feel confident in their abilities. If they ask you to repeat something, they mean to literally repeat it, not paraphrase. If an ENTJ asks you to repeat something, they probably want it paraphrased in a new way. ENTJs like to do things in new ways and get quickly bored with routine. They like to know what’s going to happen at the beginning of each day, but don’t want to repeat that same schedule every day. ENTJs are more focused on abstract concepts and long-ranging future goals. ESTJs thrive with repetition, ENTJs hate it. INFPs and ISFPS need to feel that what they are learning is important and personally significant. Impersonal facts and details hold less interest to them than things they can use to improve their lives or the lives of others. Both are very creative; ISFPs tend to excel at artistic pursuits and INFPs tend to prefer writing, although art is also enjoyed. These types need a gentle, affirming environment and desperately dislike being put on the spot. Being called upon in class without time to think things over is extremely frustrating for them. They tend to do better with one-on-one interaction. Creative projects that advance learning are helpful for them. Learning math through art, for example, or writing an unusual story for language arts will inspire them. Atmosphere Preferred: Quiet, Supportive, Structured for the ISFP and Unstructured for the INFP. Order of Instruction Preferred: Sequential and Linear for the ISFP. Big-picture first for the INFP, followed by details as necessary. How to Inspire: Tell them how the material can benefit them or others. For ISFPs, show the real-world, practical application of what they are learning. For INFPs, show the imaginative ways they can use what they are learning. Show them the future-implications. Interaction: Be direct, clear, and supportive with ISFPs. Don’t spend time theorizing or veering off on rabbit traits. Be gentle with criticism and blend criticism with praise. With INFPs, be supportive and cater to their imagination. They are motivated by big-picture ideas and possibilities and will enjoy hypothetical questions and abstract concepts. Be gentle with criticism. Different Needs for ISFPs and INFPs: ISFPs enjoy a more hands-on, kinesthetic approach to learning. Give them manipulatives and real-world opportunities to USE what they are learning. Let them get up and move around regularly. They learn better and perform better on tests when their environment is aesthetically pleasing. INFPs enjoy a more abstract, conceptual approach to learning. They are interested in novel ideas and generating possibilities. They will like posing hypothetical questions and envisioning future scenarios. Atmosphere Preferred: Collaborative, Structured, Social. A consistent routine is desired by ESFJs while ENFJs tend to get bored with a predictable routine. Order of Instruction Preferred: Sequential and Linear for the ESFJ. Big-picture first for the ENFJ, followed by details as necessary. How to Inspire: Tell them how the material can benefit them or others. For ESFJs, show the real-world, practical application of what they are learning. For ENFJs, show the imaginative ways they can use what they are learning. Discuss the future implications of what they are learning. Interaction: Be literal, clear, and supportive with ESFJs. Be gentle with criticism and blend criticism with praise. Give them plenty of time to practice and repeat what they have learned. When they ask you to repeat something, repeat exactly what you just said. With ENFJs, be supportive, imaginative, and focus on the big picture rather than details. They are motivated by future ideas and possibilities and will enjoy hypothetical questions and abstract concepts. Be gentle with criticism. If ENFJs ask you to repeat something, they usually want you to paraphrase it in a different way so that they can understand it better. Different Needs for ESFJs and ENFJs: ESFJs enjoy a sequential, step-by-step approach to learning. The more they repeat a routine the more comfortable they feel with it. They also are motivated by seeing the real-world application of their studies. They enjoy kinesthetic, hands-on activities. They tend to be more motivated by the present than the future. ENFJs enjoy a more abstract, conceptual approach to learning. They are interested in novel ideas and generating possibilities. They will like posing hypothetical questions and envisioning future scenarios. They tend to be more motivated by the future than the present. Feel free to share your experiences and opinions in the comments! Wow, right on the money! In college, I used acronyms to study for tests. Once I created an acronym, I just had to remember it and fill in the “blanks” during tests. Further, I trained myself to take notes in outline form, writing down the main idea and supporting ideas. When studying for a test, I then filled in more specific info on the outline. After following this procedure, most of the time I simply studied my notes! I am an independent learner who prefers essay type questions or writing a paper over multiple choice or true-false questions. Incredible how very close this analysis is for me.